Day 1 was a long day. It started at 4:30 am for me (BC time), and ended around midnight AB time. 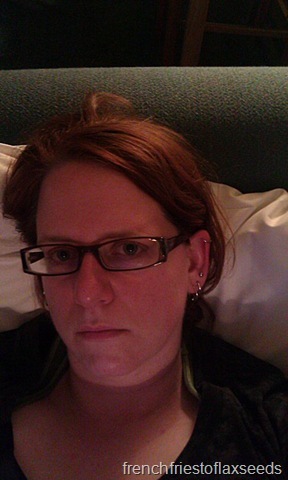 Could I look any more exhausted? I was up before the sun, because I had to make the long drive to the airport for my morning flight. In all honesty, I probably could have left an hour later, but we were also giving my cousin a ride out there as he had a flight to Toronto that was leaving an hour before mine. So in order to be on time for him, I was up much earlier than any normal human being should be – or at least earlier than a non-morning person should be! I grabbed some Starbucks at the airport for breakfast, and had an uneventful 1 hr 15 min flight to Edmonton. 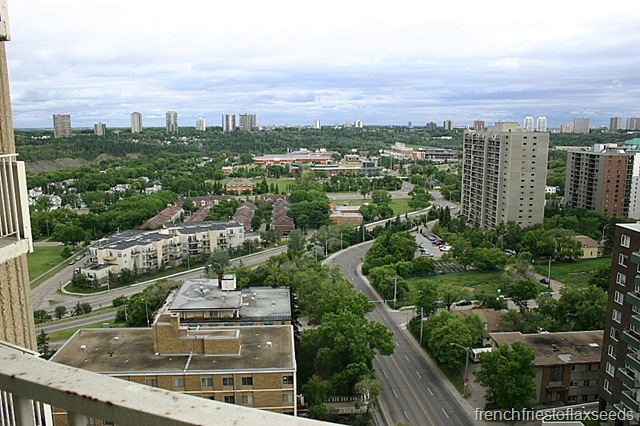 I think it took me longer to get a ride on the shuttle into downtown Edmonton than actually flying there. But I made it into the city with a good 45 min before I had to be at my first conference event. Too bad my room wasn’t ready to check in. *Hmph* So instead, I went to find a bite for lunch. Look what I stumbled upon 2 blocks from my hotel. 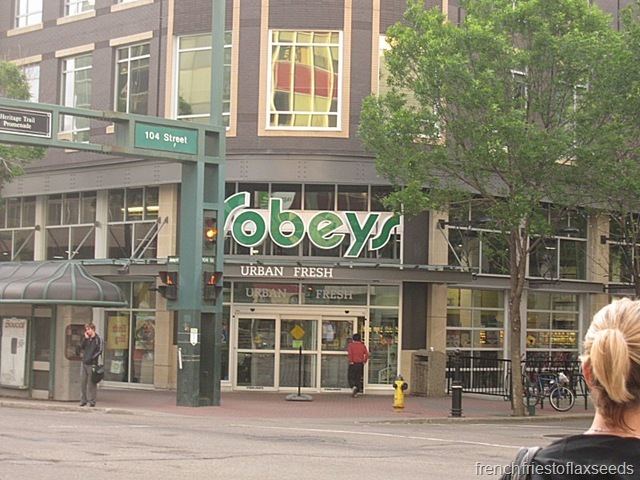 Why hello there Sobeys – owners of Thrifty Foods! Perfect! I could buy lunch, get groceries, and earn reward points and support my employer. 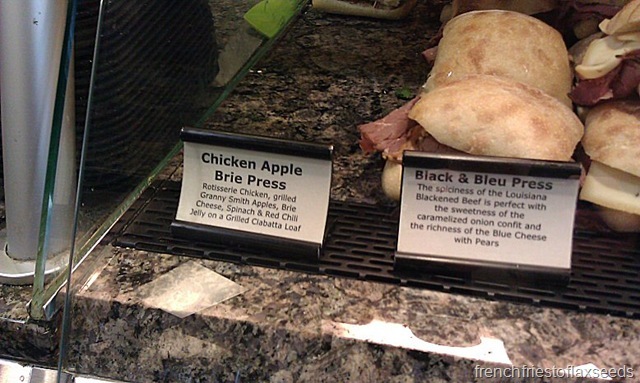 Turns out they had some delicious looking sandwiches at the deli counter. One in particular caught my eye. 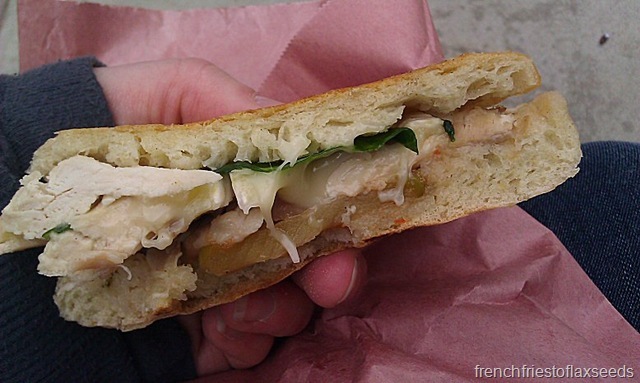 Chicken Apple Brie Press – Rotisserie chicken, grilled granny smith apples, brie cheese, spinach, and red chili jelly on a grilled ciabatta loaf. Um, yes please! I plowed through that thing on my way to the conference hotel. I did manage to stop and take a few glamour shots though. 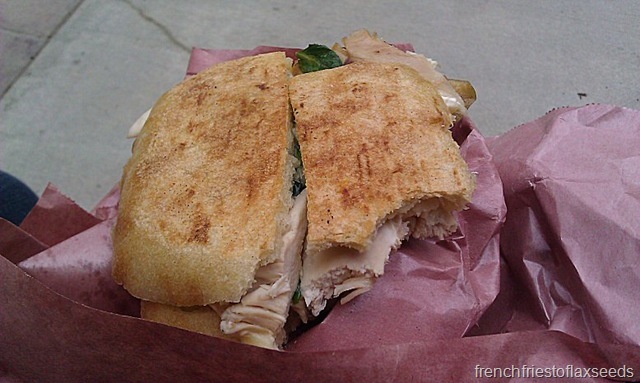 Sandwich thoughts: I like the combination of flavours – moist chicken, slightly crunchy and tangy apple, spice from the jelly, and the creamy melty cheese. I would have liked about triple the amount of spinach on there, but I’m picky like that. 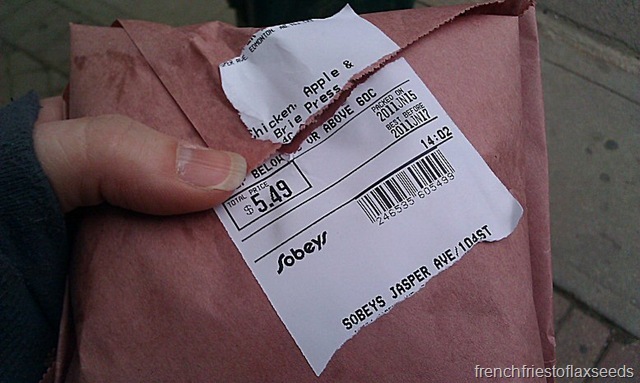 I have a feeling I will be back at Sobeys to try another sandwich before I go, as they had an awesome sounding grilled vegetable one with an artichoke pesto on it. Oh yeah. 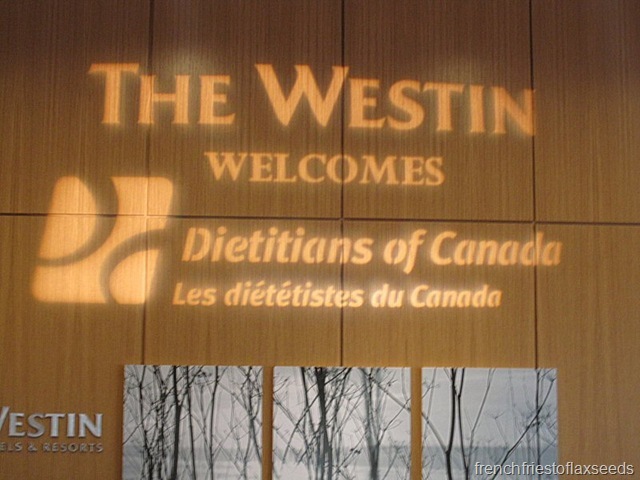 I finally arrived at the host hotel for the conference – The Westin Edmonton. I was just in time for my first event of the conference – a symposium titled “Professional Communication: A Primer for New Practitioners”. It was an excellent seminar with Anna Leiper, an RD originally from Alabama now residing and practicing in Nova Scotia. Not only was she engaging and enthusiastic, but she shared a ton of great tips and tools on how to communicate effectively with patients. 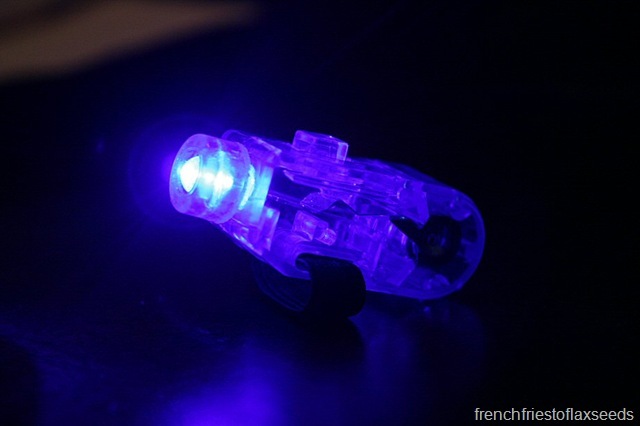 I even won a snazzy little laser pointer for answering a trivia question right. 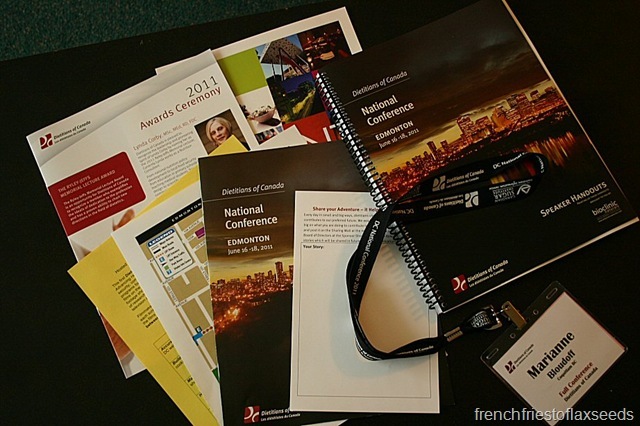 I also took the opportunity to register for the conference while I was there, picking up my program and pass. Notice the sponsor on the lanyard? 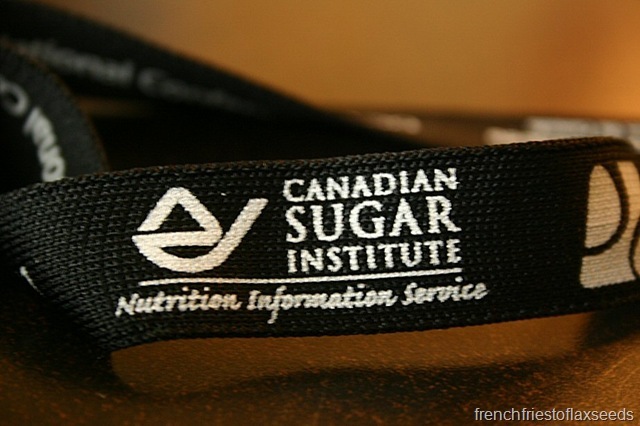 Not sure how I feel about the Canadian Sugar Institute sponsoring a dietetics conference. Seems…odd. 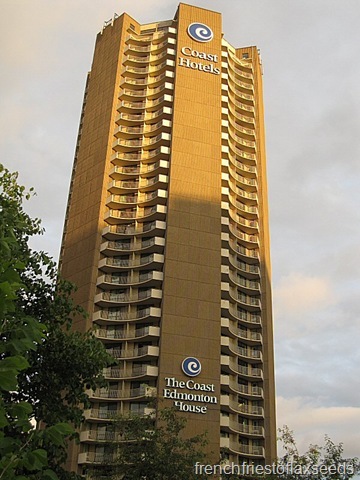 After the symposium, I hoofed it back to my hotel to finally check in. …and even a balcony with a view! 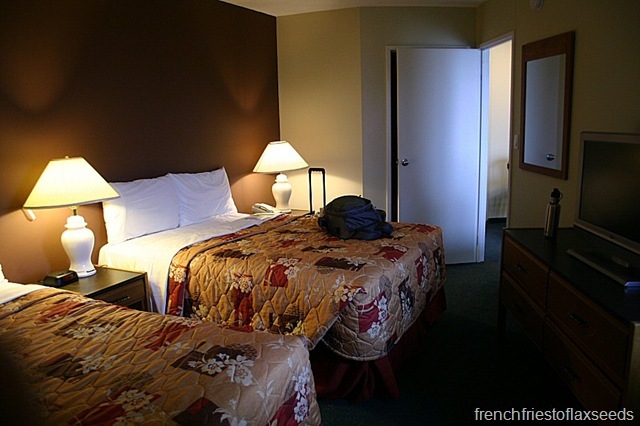 Sure, the room probably hasn’t been redecorated since 1992, but it’s just a place to sleep, so I can’t really complain. After a quick pit stop, I was back out the door. See, when I originally registered for the conference, I had bought a ticket to the student social dinner that was taking place on the Wednesday night. 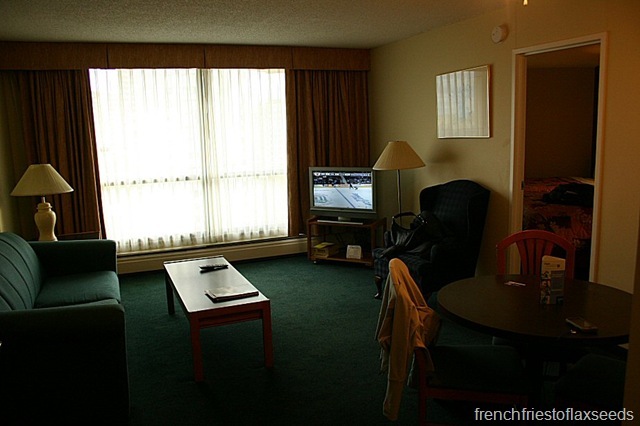 But then…the Canucks had to play Game 7 of the Stanley Cup Finals. I couldn’t very well miss that – what kind of fan would that make me? I was torn on what to do, especially since I had shelled out $40 for the event. In the end, I decided hockey was more important, and headed off to a local pub with a few students I had met at the symposium (one actually from UBC, in the year ahead of me). I had an okay veggie burger with sweet potato fries, and watched in sadness as the Canucks failed to rise to the occasion of Game 7. We only stayed for the first 2 periods, and called it a night. I went back to the hotel to watch the end of the game, then decided I needed to go for a walk. I figured since I had a fridge and kitchen, I may as well get a few things to put in it, so I hit up the grocery store for the 2nd time that day. 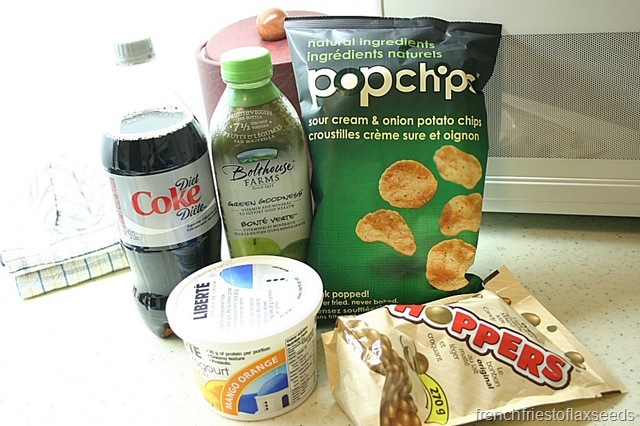 A nice balance between treats and healthy eats (or at least that’s what I tell myself). 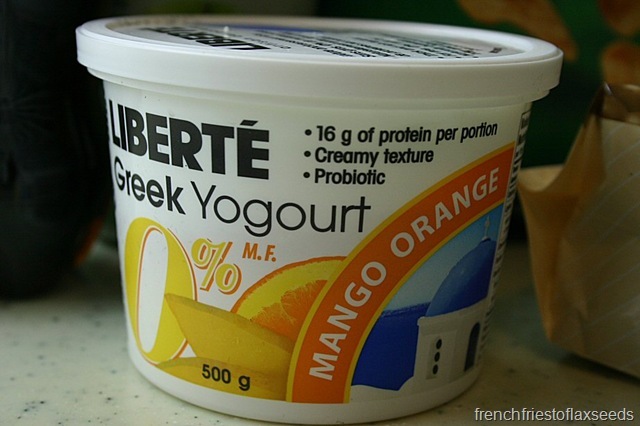 I had wanted plain Greek yogurt, but alas, they were out, so I decided to try the mango orange flavour instead (never seen it before at home). 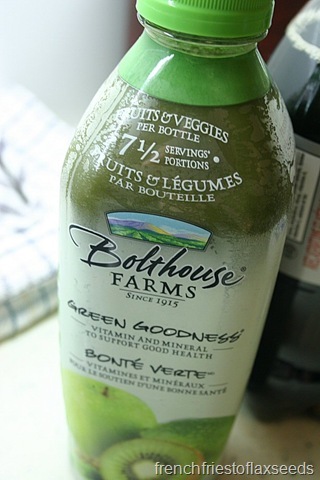 And they didn’t have my favourite Happy Planet green juice, so I settled on the Bolthouse variety instead. 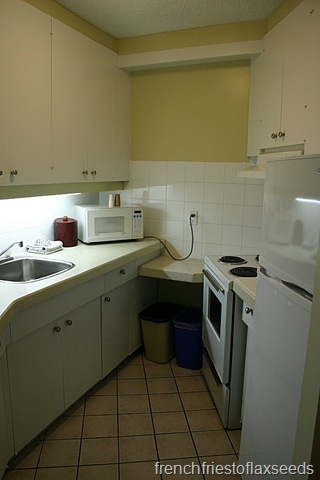 Sadly, the rest of my evening was spent watching/reading/texting/tweeting/facebooking about the absolutely idiotic riots that ensued in Vancouver after the Canucks lost the hockey game. I was not impressed with the way the media spun the event – those people rioting were not hockey fans, they were anarchists. Fans don’t bring ski masks, goggles, etc downtown with them to watch a hockey game. They were going to riot regardless of the game’s outcome. And they made our city look ridiculous to the rest of the world. Fortunately this day in age with smart phones, there are so many photos and videos of people committing criminal acts that are now being posted online and forwarded to the police – hopefully everyone who caused problems will get the punishment they deserve. But I will end my rant there. That, my friends, is what happened on Day 1 of the DC National Conference. A long day, but generally a good day. Stay tuned for more of my first dietetics conference experience! 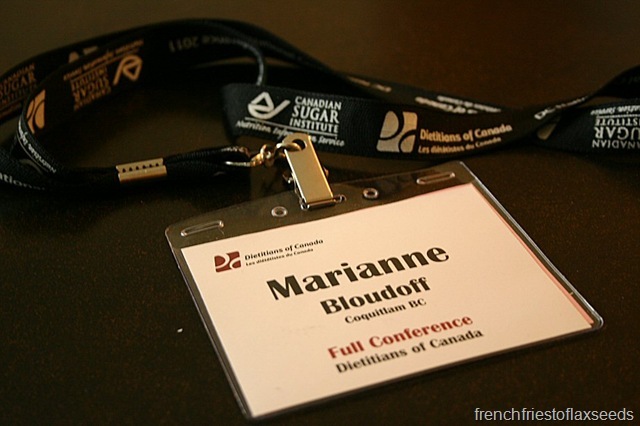 Anywho – I hope you have fun at your conference!